Words are my friend: I enjoy playing with them, reorganising them, manipulating them, and looking up new ones – all in an attempt to construct a sentence which says what I want it to say. But recently I have found myself struggling to say the right thing. There are three ladies who I follow on Twitter who are dealing with cancer; they tweet their way through their battles with honesty, braveness and humour. But of course, by choosing to share their stories in public (for which I am in no way criticising – that would be a tad pot and kettle ha), they are inviting responses to their situations. And I find myself worrying about what the right response is. Have I got the balance between empathy and humour? Will it make them smile? What if I say the wrong thing? Now clearly worrying about what to say doesn’t even touch the sides of all the worry that goes with having cancer, but it has me thinking about what is the right thing to do and say in these situations. I am the person who wants to say something, maybe because of my love affair with words, or maybe because of my love affair with people – but I have found recently that I am nervous about pressing send on a reply to a heartfelt tweet. My responses are intended to bring a little smile, nothing more; I know my place in the support food chain: I am a stranger, not a family member. But if it is not even doing that, if it is causing eye rolling or worse offense, then I would be better not sending it. I have watched as one of these ladies has tried to direct people’s responses to her blogs and tweets; to move the talk away from ‘just’ cancer, towards fun and silliness; to put a stop to the barrage of ‘thinking of you’ messages. And I admire her for taking charge of the situation, but I was one of those guilty of throwing in a ‘thinking of you’ here and there. And whilst I am in no way offended by her asking for what she needs, I have found that I have lost my confidence in knowing what to say; and on occasion I have not said anything in fear of getting it wrong. And you hear this don’t you? People crossing the street and avoiding eye contact with those who have been through a difficult time, people who I guess are also not sure what to say. My Auntie died a couple of weeks ago. I haven’t seen her or my Uncle for 20 years, but she was a bigger part of my life when I was younger and I wanted to send a card with some meaningful words. I spent time thinking about what I wanted to say and carved what I hoped were thoughtful sentences. But of course, I don’t know if that is how they were received. And this is the crux isn’t it? Intent versus impact. We are all trying to do and say the right thing, but because we are all so wonderfully unique, we respond to each word differently. What is meaningful to one person is a cliché to another, what I find funny, you may find insensitive, and so on. It is easier with people we are close to, of course. My best friend and I seem to always say the right thing to each other: we understand each other, we know what each other’s funny is, we know when to go in for empathy, or when to go straight for the humour pick-me-up line. And we also trust each other, so even if an eye rolling moment does occur, we are more likely to laugh about it; there is so much credit in the friendship account that it can take the odd knock here and there. But what about with those people we don’t know as well? 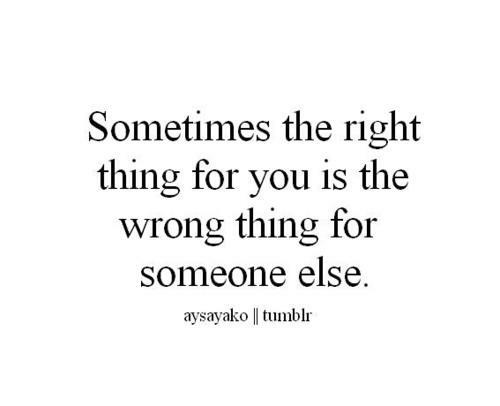 To stop trying to say the right thing is not the answer is it? It is more offensive surely, to say nothing, to ignore a person’s heartache. So I will continue to try to say the right thing, putting myself in that person’s shoes, adopting a style to mirror theirs, hoping that by taking the time to try to get it right, I will at least increase my chances of doing so. Because I do not want to be the person who crosses the street, or the person who says nothing. I want to be the person who shows empathy, who can connect with people, and if possible, spark a smile. And I will also remind myself that this is the privileged position to be in: a position of worrying what to say is a position of luxury, a position to be appreciated. Jeez, because if all I have to worry about is saying the right thing, then I really have nothing to worry about at all. I’d love to hear your thoughts on this topic. How do you handle such situations? Do you feel confident in saying the right thing? It helps me to remember that I can say, “I don’t know what to say”. And talk about my feelings perhaps – feeling stunned or bewildered or sad or whatever. That’s really good advice – should have known being honest was the way to go! Yes things are on the up with me in about the last month or so – after a quite difficult year or so. Words are gifts for the right occasion…..if it’s not ‘right’ then don’t unwrap the gift. Now this is an interesting perspective David. I will have to think on this one. I know how lovely you are though, so I am sure you are not saying become the person who crosses the street?